It’s amazing to see all the discussion ensue over that little ol’ Confederate flag. Factual, truthful discussion is good. Race-baiting barbs, one-liners, and misinformation is not helpful. We’re seeing a lot of both. It appears plain to me that some folks don’t want a future for black people, and it also appears to me that a lot of other well-placed people are prepared to let them run with that plan. Are you one of them? Since the shooting in Charleston last week, approximately 15,000 children have lost their lives in this country; legally, according to the nine black-robed Nazgul; safely, at least if you don’t count the baby; but scarcely rarely. Blacks make up about thirteen percent of the general population, and yet are represented in about 35 percent of the abortions. That is disproportionate enough to lean genocidal, and to make it the actual legacy of the very white bones of Margaret Sanger. That means 5,250 of these children, slaughtered legally since last Wednesday, were black. Who speaks for them? I don’t count because I have a picture of Stonewall Jackson in my office. When it comes to this subject, President Obama is a partial birth abortion ghoul and a large number of people from the soft evangelical middle voted for him. Twice. But what did they vote for when they did that? They voted for the continuation of a policy that on average takes one out of every four black Americans out of line and kills him dead. And everybody who voted for Obama, white or black, voted for that and ought to retire from lecturing anybody else over race relations ever again. The 15,000, white and black, who have lost their lives since last week do not have any makeshift memorials springing up anywhere. No flowers propped against fences and no teddy bears left for the nameless. Nobody in any position of significant influence speaks for them with any kind of moral authority. But since we are talking about racial justice here, let us just address that aspect of our national tragedy. 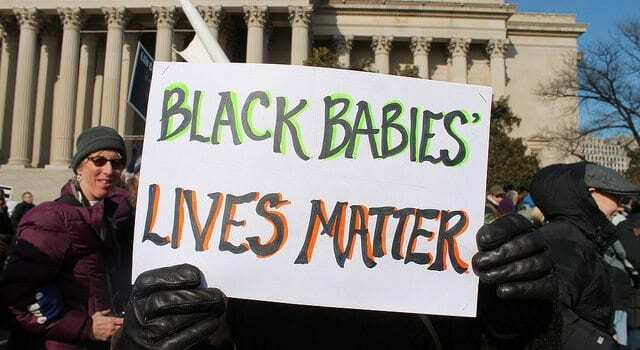 Since Roe, about 13 million black children have been executed. 13 million. That is roughly the total population of Hawaii, Idaho, Maine, New Hampshire, Mississippi, New Mexico, and Nebraska. So black lives matter, do they? And coming back to the point, what flag flew over the courthouses that continue to authorize this crimson carnage? What flag was still flying there just this morning? How many more decades before the great principle of flag indignation kicks in? So when I move from the shooting in Charleston to abortion, I am not changing the subject. We are talking race-based murder in both instances. 13 million. Be sure to read the full article here. Yes, it’s long. But you’ll be glad you did!